Is Safaricom a dominant player in the telecom market in Kenya? If so, what should be done about it; what can be done about it? Looking at the relevant laws and industry regulations, what must be done about it? Has Safaricom abused its position if it is a dominant player in the telecom market in Kenya? Where does that leave consumer choice for services such as money transfer and voice call services? And what do the laws governing competition in Kenya say about the matter, anyway? The last several years have seen various manifestations of these and related questions. What started as a faint rumble within the money transfer service sector has grown and turned into a burning issue in technology and telecom services. At the very core of these questions and any possible answers is the concept of fair competition, and the relevant competition law that regulates the conduct and organisation of business corporations in the interests of promoting fair competition to guarantee benefit for consumers. In the United States, such laws became famous in the late 1880s when large corporations called “trusts” acquired excessive economic power and were then the targets of laws and regulations aimed at freeing up competition and allowing small industry players to also set up their own business in sectors dominated by the large trusts – as a result, fair competition law came to be known as “anti-trust law”, a name that is still in use today. Until the 1980s, Kenya’s economy was dominated by an overarching price control regime. However, this became unwieldy and difficult to maintain, and Kenya was at any rate coming under pressure to facilitate free trade and open up into a market economy. As the government of the day moved towards ending the price control regime, it was realised that competition law was required. The Restrictive Trade Practices, Monopolies and Prince control Act was enacted and came into force in 1989, providing for the control of restrictive trade practices, as well as for control of collusive tendering, of monopolies and concentrations of economic power, and of mergers and takeovers. This Act had its roots in previous laws, starting with the Price Control Ordinance of 1956, which was revised in 1972 after it had become the Price Control Act. Its central objective was to protect consumers against price hikes. This Act persisted in various forms and revisions until, as The Restrictive Trade Practices, Monopolies and Prince Control Act (No. 14 of 1988), it was repealed by The Competition Act, No. 12 of 2010. The Competition Act established the Competition Authority of Kenya (CAK), whose job is to enforce compliance with the Act by receiving and investigating information relating to competition in market segments in Kenya, and using its considerable powers to enforce fair and competitive market practices by the respective players in those market segments. The Act explicitly defines what a dominant market player is. In 4(3) (b), it defines a dominant position in service provision as being the case if a person (or entity) “…provides or otherwise controls not less than one-half of the services that are rendered in Kenya or any substantial part thereof”. Safaricom is a player in several sectors within the telecom market in Kenya: in voice traffic, in data, in messaging, and in mobile money transfer. The Communications Authority of Kenya (CA) keeps and updates sector statistics about the telecom sector in the country. The latest published CA statistics report contains the sector statistics as at the period of July – September 2015. According to the CA report for that quarter, Safaricom has a 66.3 per cent market share in mobile subscriptions in the country. This, the report continues, has enabled Safaricom to own a 75.6pc market share of local mobile voice traffic. Therefore, as far as mobile subscriptions and mobile voice traffic are concerned, as per The Competition Act, No. 12 of 2010, Safaricom is a dominant player. The mobile money transfer market in Kenya had, over the July – September 2015 period, a total of 28,777,420 subscribers spread across the various providers in the country. Of these, Safaricom has 22,127,622 subscribers – a market share of 76.9pc. Applying the criteria of The Competition Act, No. 12 of 2010, Safaricom is a dominant player in the mobile money transfer market. 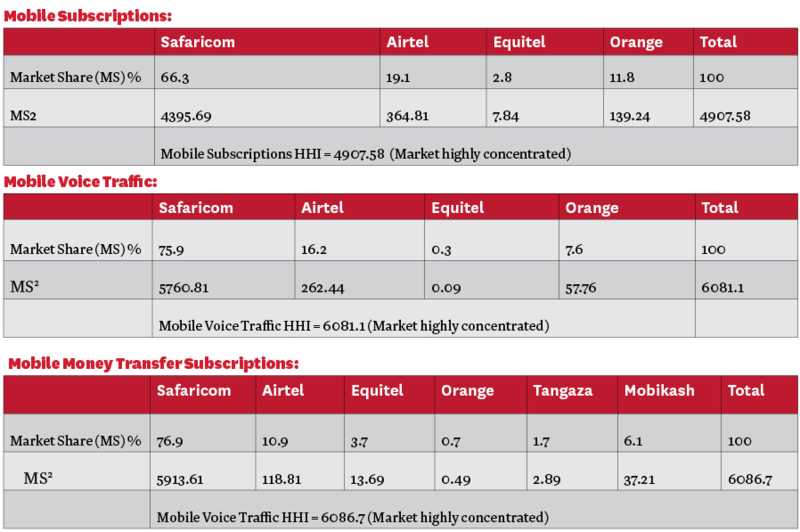 The Short Messaging Service sector rides on the mobile subscriptions sector in Kenya. Of the over 7 billion short messaging service (SMS) messages sent in the period July – September 2015 in Kenya, 89.6pc were sent using the Safaricom network, with the rest of the operators splitting the rest. Safaricom is, therefore, easily the dominant player in the SMS sector in the country – under the terms of The Competition Act, No. 12 of 2010. This picture extends to the Internet and data market. This sector has more players, including fixed line and terrestrial wireless data operators, as well as mobile data and satellite data providers. In the mobile Internet/data market, Safaricom has a market share of 64.1pc. To answer our first question, the statistics presented by CA make it clear that Safaricom is a dominant player, because in each of the various telecom market segments, it has a market share that far exceeds the threshold of 50pc that is set by The Competition Act, No. 12 of 2010. Late last year, the CA released a set of Public Consultation documents proposing new regulations to guide various sectors of the telecom market. Among these was the “Fair Competition and Equality of Treatment Regulations 2015”, released under the Kenya Information and Communications Act No. 2 of 1988. These regulations sought to give the CA some teeth to act upon what it perceives as unfair practices within the telecom market in Kenya, and they included some extensions and clarifications of terms used in The Competition Act, No. 12 of 2010. In Section 7 of the Fair Competition and Equality of Treatment Regulations 2015, the CA defines what it interprets as a “dominant market position”, with the defining factors including the market share of the operator in question – using sales volumes, revenues and number of subscribers as a basis – as well as an operator’s variations in service prices over time, an operator’s ability to block other operators from entry into the telecoms market using various means – among them buying power, superior access to capital markets, and a superior negotiating position – and, perhaps most controversially, what the CA terms “the ability of the licensee to earn supernormal profits”. In addition to these factors, the CA also includes an operator’s ability to make independent rate-setting decisions and its ability to raise prices without suffering a commensurate loss in service demand relative to operators. This means, “take the square of the percentage market share of the first player, add it to the square of the percentage market share of the second player, add that to the square of the percentage market share of the third player, and continue until you have covered all the players. The interpretation of the HHI index is fairly straightforward: if the HHI value is less than 100, the market is highly competitive. If it is between 100 and 1000, the market is not concentrated. If it is between 1000 and 1800, the market is moderately concentrated. If it is over 1800, the market is highly concentrated, and the market has a super-dominant player. The calculations above show the obvious: Safaricom is a super-dominant player in virtually every telecom sector in Kenya, save for the fixed-line sector. With such a dominant player in the market, the question then turns to the effects of that dominance. Is market dominance good, or is it bad, for the consumer of telecom services in Kenya? A super-dominant player in any market inadvertently behaves like a monopoly. In 2012, Airtel filed a complaint with the CA against Safaricom, alleging that Safaricom was abusing its position as a dominant player in the mobile money transfer sector. The matter was terminated by the CA after Safaricom offered to negotiate and settle the issue directly with Airtel, but the matter ended up in court a year later, with Airtel saying it was never settled. Airtel claimed Safaricom was favoured by the CA in the matter. In 2015, Airtel once again filed a petition with the CA, this time alleging that Safaricom was charging lower tariffs for calls within its network, compared to calls to the subscribers of other operators in the market. It alleged that the difference in voice tariffs locked customers into Safaricom and was therefore an anti-competitive move that distorted the market in favour of Safaricom itself. Various other operators have at one time or the other accused Safaricom of unfair or even monopolistic practices: Equitel accused Safaricom of arbitrarily increasing the fees charged to Equitel customers transferring money to Safaricom’s M-PESA mobile money service. This was after Safaricom doubled the fees without notice. Do these practices justify a tougher line being taken against Safaricom by the CA? Unlikely. The CA has been a laggard in enforcing industry regulations, and mobile operators in Kenya have taken advantage of this to offer shoddy services to their subscribers. In order to ensure provision of good quality mobile services in the country, the CA came up with Quality of Service (QoS) Key Performance Indicators (KPIs) that all mobile operators were required to comply with. In 2012-2013, Safaricom failed to meet any of the QoS KPIs. In 2013-2014, Safaricom, Airtel and Orange all failed to meet the required QoS KPIs. When the CA report was issued, Safaricom simply dismissed it. In 2015, the CA proposed new measures to force operators to comply with QoS KPIs: non-compliant operators would be fined 0.2pc of their revenues if they fail to comply with the KPIs. In the year ended March 31 2015, Safaricom had gross revenue of Sh163.4 billion, and a profit after tax of Sh31.9 billion. If the CA were to carry out its threat, Safaricom would be fined a mere Sh326 million – a fine that Safaricom can pay without batting an eyelid. Mere fines will, therefore, not make Safaricom turn to compliant status – the company makes way too much money to be bothered by the pinpricks that current fines amount to. The damage that a player as dominant as Safaricom inflicts on a market is not just in the way it treats rivals, but more in the resultant death of innovation. It is impossible to invent anything in the mobile sector in Kenya without taking Safaricom into account. The most innovative work in Kenyan technology today is happening around mobile money and banking, but anyone seeking to enter the sector must ensure that their invention is Safaricom-compatible. This situation is almost unique in the world today, but a previous example existed in the United States before 1982: the AT&T Corporation controlled the Bell Operating Companies, which completely dominated telephone services in the USA and Canada. The dominance was so complete that even the telephone equipment used in the USA and Canada was made by a subsidiary of AT&T. The decision was arrived at to break up the Bell system into seven independent companies, and competitors and other investors were allowed to acquire controlling stakes in these new companies. The result was a surge of competition in the telecommunications market in the USA and Canada, a drastic drop in long-distance call costs, an increase in innovation in how TV content was distributed in the USA and Canada, and an explosion in connectivity of cable and satellite telephone and TV connections. It is clear that Safaricom’s main lock-in attraction is its money transfer service, M-Pesa. 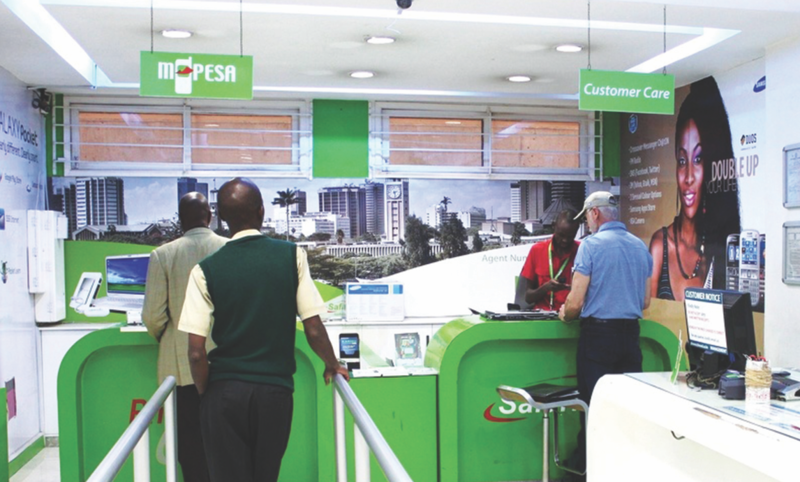 Most accusations of monopolistic or unfair practices from its rivals are around M-Pesa. The money transfer service is so dominant that it is estimated nearly 50pc of Kenya’s GDP flowed through it in 2015 alone. This is impressive, but it also gives Safaricom a choke-hold on a large section of the Kenyan economy, and represents a dangerous single point of failure in the flow of money in Kenya – because of its dominance, other money transfer methods like money orders and postal orders have effectively died. That one company should so heavily dominate the country is not just bad, it is also incredibly risky – Safaricom is controlled by Vodafone, a British company whose main incentive is profits. If a situation arose in which Vodafone had to choose between Kenya’s economy and its profits, it’s quite obvious what its choice would be. And so the CA must avoid the temptation to once again slap Safaricom on the wrist, and instead set in motion a serious initiative aimed at replicating what the US authorities did to AT&T: because M-Pesa is so dominant and is effectively a monopoly, and because it is so vital to the economy of Kenya, the service must be hived off from Safaricom, into a new company. This new company would of course be part-owned by Safaricom, but the majority stake must be owned by the public. The new M-Pesa company would be a mobile money infrastructure corporation, one that would allow anyone to lease its services for money transfer. This would force Safaricom to focus on the services that its license was granted for: telecom services of good quality, by removing the one bargaining chip that allows the company to ignore CA and look askance at consumers’ demands for quality voice and data services. This are the kind of articles that should be forced on those old folks in CA / CAK. if safaricom was operating in uk or us market it could have closed long time ago due to fines by authorities there.